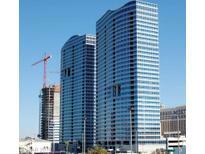 Below you can view all the highrises for sale in the Panorama Towers 2 subdivision located in Las Vegas Nevada. Listings in Panorama Towers 2 are updated daily from data we receive from the Las Vegas multiple listing service. To learn more about any of these highrises or to receive custom notifications when a new property is listed for sale in Panorama Towers 2, give us a call at 702-323-5933. Adjacent the world famous Las Vegas Strip, this community offers its residents a variety of amenities, including concierge services, access to a world class fitness center, 24/7 valet and even complimentary limo services. MLS#2088776. Foster Realty. Large Floor plan Featuring Floor to Ceiling Windows w/Motorized Blinds, Wood Flooring & Travertine Tile Through-Out, Large Living Room facing the NEW LAS VEGAS RAIDER STADIUM, Formal Dining Room, Large Kitchen w/Stainless Appliances, Granite Counters, 2 Breakfast Bar Counters, Master Suite w/Walk-In Closet Custom Cabinets & Large Bath, 2 Terrace/Balconies, 2 Assigned Parking Spaces MLS#2088267. Keller Williams Southern Nevada. Fantastic Guard Gated & Fully Furnished, Very Well Cared For By Original Owner, Lowest Priced End Cap Unit With 2 Balconies With Both Strip And Mountain Views, Designer Decor,Custom Paint, Whole Unit Real Wood $17,000 Floors And Power Shades $9,000, Granite Counters, Ge Monogram Appliances, Gas Stove, World Class Amenities Include,Fitness Center, Pool/Spa, Theater Game Room, Free Limo Service,2 Parking Spaces ( $25,000 Value ) And Secure Storage MLS#2085482. Schumacher Realty Group. Guard gated. 2 spaces in parking garage. MLS#2084202. Pro Connection Realty. HOA Dues Include Basic TV & Wifi, Driver Service, Gym, Pool/Spa. MLS#2083521. Elite Realty. Don't roll the dice & let this one get away! MLS#2078029. Platinum R.E. Professionals. The building features fitness center with spa and steam room, valet, fitness center, swimming pool and spa, all located within minutes of the Strip. ABSOLUTELY STUNNING! ! MLS#2076876. Northcap Residential. High rise living at its finest MLS#2076273. Schumacher Realty Group. Stunning backsplash, custom window from master bedroom into living room w/ ELECTRIC SHADES! GORGEOUS & PRICED FOR QUICK SALE! MLS#2073305. Mahsheed Real Estate LLC. Luxurious amenities including Pool, jacuzzi, steam room, sauna, valet parking, limo service, spa and the fitness center. MLS#2073132. Keller Williams Southern Nevada. Sold Furnished Except Art Work,Personal Items, Fax, Computer. MLS#2072059. Realty ONE Group, Inc. Turn key ready. Easy Strip Access. MLS#2069560. All Vegas Valley Realty. 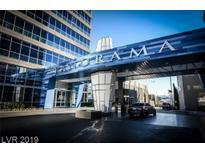 Owners at Panorama enjoy limo service, fitness center and much more MLS#2064149. Schumacher Realty Group. Stunning Views Strip&Raiders Stadium from Floor2Ceiling Glass Walls in LR, Master & Balcony*Gorgeous Built-in Bar+Tons of EXTRA added Builtin Storage*Hardwired Power Shades T/O*Brand New Carpet & Paint*Kitchen w/ Extra Pantry Space,Lg Breakfast Bar,SS Appliances*State of the Art Amenities:Beautiful Pool,Spa,FULL Fitness Ctr,Concierge Services,24hr Security,GuardGated,Valet,Limo Service,Theater&Rec Room & Plenty more-too much to mention! ! MLS#2057812. Pacific International Realty. Step outside on your private balcony over looking the views of the city lights and the Raiders Stadium MLS#2054426. Vegas Realty. DON'T MISS THIS INCREDIBLE OPPORTUNITY to OWN so close the LAS VEGAS STRIP! MLS#2047394. Blue Diamond Realty LLC. One Of The Larger Models At 2324 Square Feet;includes A Great Rm & Terrace**separate Formal Dining Rm & Nice Sized Kitchen With Granite Counters & Eating Nook**unit Includes Double Masters With Baths And Separate From Each Other**community Is A Guarded Entry With Valet, Concierge Services, Fitness Area & Outdoor Pool**location Is Close To Shopping & Activities On The Strip**a Very Pristine Unit On The 32nd Floor With Mountain & Valley Views** MLS#2046929. Realty ONE Group, Inc.